Lysozyme protects us from the ever-present danger of bacterial infection. It is a small enzyme that attacks the protective cell walls of bacteria. Bacteria build a tough skin of carbohydrate chains, interlocked by short peptide strands, that braces their delicate membrane against the cell's high osmotic pressure. Lysozyme breaks these carbohydrate chains, destroying the structural integrity of the cell wall. The bacteria burst under their own internal pressure. Alexander Fleming discovered lysozyme during a deliberate search for medical antibiotics. Over a period of years, he added everything that he could think of to bacterial cultures, looking for anything that would slow their growth. He discovered lysozyme by chance. One day, when he had a cold, he added a drop of mucus to the culture and, much to his surprise, it killed the bacteria. He had discovered one of our own natural defenses against infection. Unfortunately, lysozyme is a large molecule that is not particularly useful as a drug. It can be applied topically, but cannot rid the entire body of disease, because it is too large to travel between cells. Fortunately, Fleming continued his search, finding a true antibiotic drug five years later: penicillin. Lysozyme protects many places that are rich in potential food for bacterial growth. The lysozyme pictured here is from hen egg whites, where it serves to protect the proteins and fats that will nourish the developing chick. It was the first enzyme ever to have its structure solved--you can find it in PDB entry 2lyz . Our tears and mucus contain lysozyme to resist infection of our exposed surfaces. Our blood is the worst place to have bacteria grow, as they would be delivered to all corners of the body. In the blood, lysozyme provides some protection, along with the more powerful methods employed by the immune system. Lysozyme (left) and a form with an engineered disulfide linkage (right). Lysozyme is a small, stable enzyme, making ideal for research into protein structure and function. Brian Matthews at the University of Oregon has performed a remarkable series of experiments, using lysozyme as the laboratory for study. He has performed hundreds of mutations on the lysozyme molecule made by a bacteriophage, changing one or more amino acids in the protein chain to a different one. He has studied the effect of removing large residues inside the protein, leaving a hole, or cramming a large amino acid inside, where it would not normally fit. He has attempted to create new active sites by creating new molecule-shaped pockets. 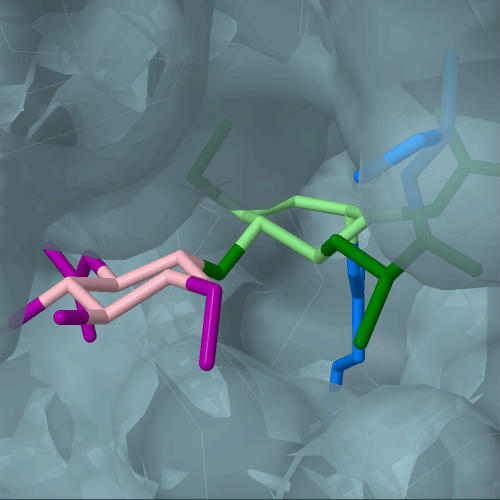 Structures of hundreds of these mutant lysozymes are available at the PDB--so many, in fact, that lysozyme is the most common protein in the PDB. The example shown here is a mutant were two amino acids (shown in green) have been changed to cysteine, forming a new disulfide bridge (the two bright yellow atoms) in the mutant. The native enzyme, from PDB entry 1lyd , is on the right and the mutant, from PDB entry 1l35 , is on the left. Lysozyme has a long active site cleft that binds to the bacterial carbohydrate chain. The structure shown here contains a piece of the bacterial cell wall, including two sugar rings and a short piece of the crosslinking peptide. Based on computer modeling, it has been proposed that lysozyme distorts the shape of one sugar ring in the chain, making it more easy to cleave (although other studies have proposed that different effects, like electrostatics, are more important). This structure, PDB entry 148l , shows what this distorted ring might look like. Normally, sugar rings adopt a zig-zag "chair" structure, like the purple-colored ring on the left. Compare this to the ring on the right, colored green, which is flattened into a less stable structure. To explore this structure in more detail, click on the image for an interactive JSmol. R. Kuroki, L. H. Weaver & B. W. Matthews (1993) A covalent enzyme-substrate intermediate with saccharide distortion in a mutant T4 lysozyme. Science 262, 2030-2033. 1l35: P. E. Pjura, M. Matsumura, J. A. Wozniak & B. W. Matthews (1990) Structure of a thermostable disulfide-bridge mutant of phage T4 lysozyme shows that an engineered cross-link in a flexible region does not increas the rigidity of the folded protein. Biochemistry 29, 2592-2598. 1lyd: D. R. Rose, J. Phipps, J. Michniewicz, G. I. Birnbaum, F. R. Ahmed, A. Muir, W. F. Anderson & S. Narang (1988) Crystal structure of T4-lysozyme generated from synthetic coding DNA in Escherichia coli. Protein Engineering 2, 277-282. 2lyz: R. Diamond (1974) Real-space refinement of the structure hen egg-while lysozyme. Journal of Molecular Biology 82, 371-391.